In fact, the Mandurah musician claims the mental illness almost cost him his life. ‘It was a build up of things that then snowballed and consumed me and my life,’ Walker said. ‘However, if it wasn’t for the passion I have for music, then I may not have pulled through. 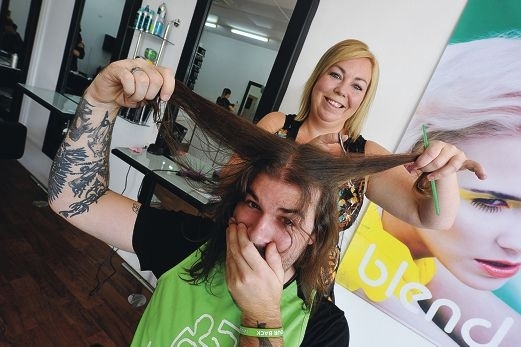 Walker’s commitment to highlighting the prevalence of depression in the community has resulted in him pledging to shave his trademark long hair. ‘I’ll be losing my image for the cause,’ he said. The Headspace National Youth Mental Health Foundation provides mental health and wellbeing support, information and services to young people aged between 12 and 25 at 40 centres across Australia. Services include general health, mental health services, education and vocational services as well as alcohol and drug services. Walker will have his locks lopped by Envious Hair and Beauty Culture staff at the Brighton Hotel on June 2. The event will be hosted by Squinty from Coast FM and Justin Burford will be performing. After the shave, Walker will perform his first show bald. To donate, visit http://pers onalchallenge.gofundraise .com.au/page/TheRobWalker.